Born: 21 January 1792 and died 1870. Daughter of: William Marsh (1755-1846) and his first wife Amelia Marsh (nee Cuthbert) (1765-1793). 6. William Marsh (1795-10 September 1824). 8. 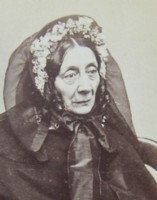 Georgiana Nelson Marsh (1801-1861). Ann married: Monsieur Gabiou de Chanceaux. 3. A mention in the will of her sister Georgiana Nelson Marsh. Ann married Monsieur Gabiou de Chanceaux. They had no children and she died a widow in Paris in 1870, her last illness brought on by the severity of the winter and the hardships incurred in Paris after the seige.